Team Arctic Tops Hay Days Podiums - Midwest Sports Publishing Network, Inc.
Thief River Falls, Minn. (Sept. 26, 2018) – Team Arctic drag racers brought the victory heat to the 2018 Sno Baron’s NDRS Hay Days Grass Drags in North Branch, Minn., scorching the competition at the sport’s biggest stage with 10 class wins and 33 podium finishes. Team Green’s dominating performance included winning three of four Stock classes (two of which were podium sweeps) as well as the massively modified Outlaw and Lakeracer classes. Craig Wyent and Jennifer O’Connor represented Team Green on the Hay Days drag strip. Eight different Team Arctic racers stood atop the podium at Hay Days, with Randy Bernstein and Will Ohara each taking two wins. The other Team Green class winners included Dylan Roes, Craig Wyent, Kyle Shilts, Steve Brown, Jeff Labelle and Joe Schneider. 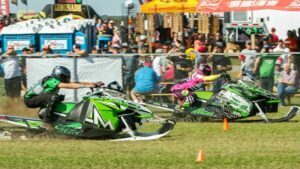 Arctic Cat snowmobiles once again proved to be the quickest in the Stock categories, with Bernstein leading a top-3 Team Green sweep of Stock 900 and Stock 800 finals.